MTBE - View topic - Oh dear, I bought a road bike. Oh dear, I bought a road bike. Posted: Mon Sep 11, 2017 9:26 pm Post subject: Oh dear, I bought a road bike. Well, I went and got me a road bike. 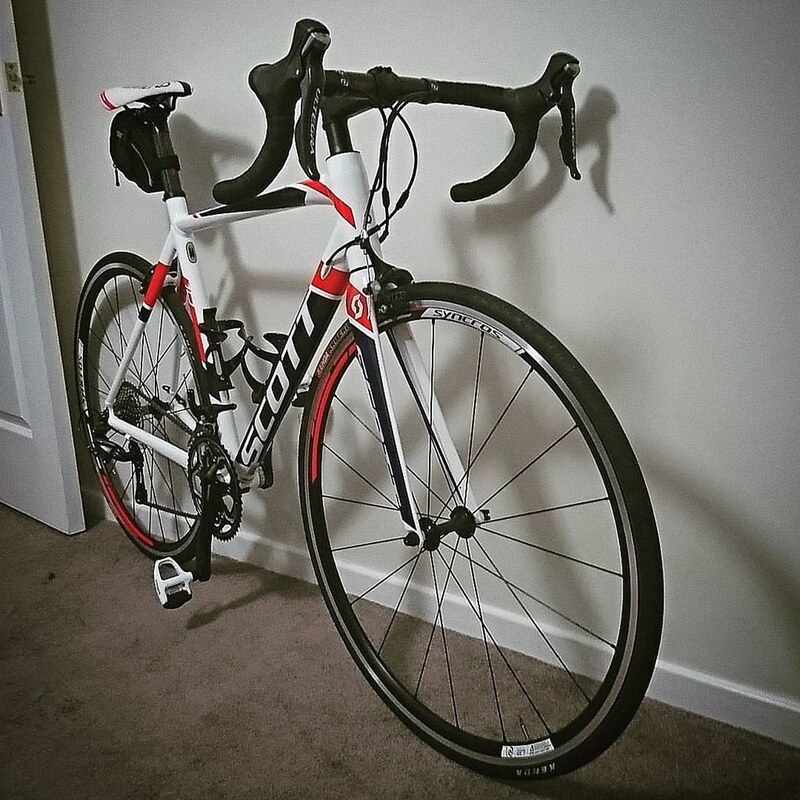 I wanted to get some miles in over winter this year and thought I would give it a go on a road bike. I found this three year old bike that has never been ridden on. The guy bought it new and never rode it one mile. He fell seriously ill right after he bought it and then spent three years in the garage. Time to go talk to the parents. Welcome to the club of reluctant roadies. Can't beat Scott bikes. Nice. Can you not get miles in on an MTB ? Just of a more muddy nature ? There is a worrying trend of MTBers who think the only way to get fit is to get "road miles in ". And an even more worrying trend is they decide Road Biking requires less hassle and stick to riding on Tarmac. You will get fitter riding your miles through the gloop and have more fun in doing so. I have to admit I am quite enjoying mine but it's not a patch on the Nuke. I bought it to avoid resenting the MTB for slamming out training miles. It's a toy and should be enjoyed as such. All you need now is a Lycra speed suit and friends called Gideon and Dante to ride with you. More seriously I found road biking helped my mountain biking especially up hill. I do it when the trails turn to sludge round here over the winter. Hit the nail right on the head. I keep my bikes in the house and have to clean them before bringing them indoors. The trails round here become unrideable in winter. I got sick of coming home and cleaning off horrible crud while I freeze my hands off. The last few years I just stopped riding in the winter months. I couldn't be bothered with the rigmarole of cleaning them after every ride. Then comes spring, and I just hate how hard it is to climb again. I like to travel all over the country to ride trails in the spring and summer, but the climbs can be brutal in some of those places. As you know, when your fitness is off you can't enjoy the downs if your legs are spent on the hill climbs. This winter I plan to ride a lot of road to keep my fitness how I like it. They will be no lycra involved, I have plenty of winter mtb clothes for that. As for friends, no thanks. I have no tolerance for other peoples macho bull sh&t. I much prefer to ride solo and do my own thing. Why don't you get an Ebike, they say. NO &ucking way. As long as this old body can walk and go to work, it can still ride under it's own steam. As far as I'm concerned, they are for the fat lazy, very old and people with a disability. Why don't you get an Ebike, they say... ...they are for the fat lazy, very old. It certainly doesn't bother me if some one over takes me on any hill and I'm happy to sit behind some one on a hill climb if they are slower. In fact I will try and strike up a convo if they are inclined . Egos and c*ck measuring are for race days. I did however catch and overtake a couple of other spritely lads on a techy single track that day (CYB, Red) who had passed me on the climb .. not c0ck measuring, but it made me feel a bit better for being a "climbing mong"
I find it makes a change and come spring when it dries out you are good to go. The only thing is watch out for ice and strong winds, no worth the risk.